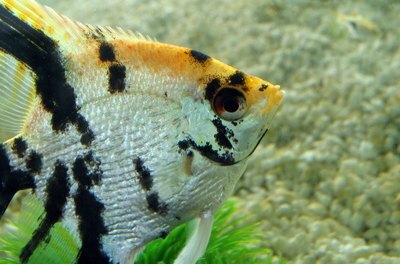 The graceful angelfish are considered one of the most docile cichlids. Despite most cichlids being highly aggressive fish in an aquarium community, several species of cichlids are calmer and more docile. 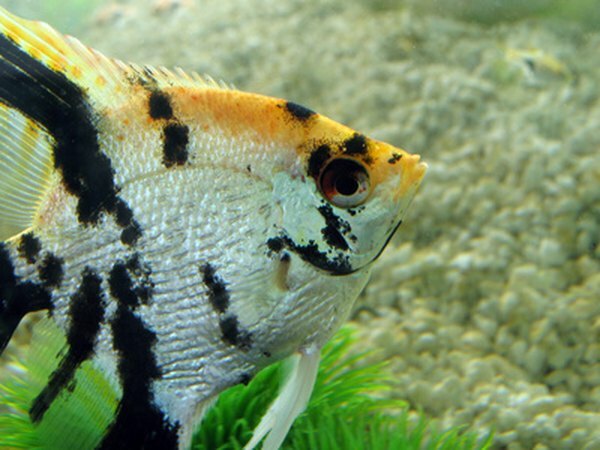 Angelfish, for instance, are among the most docile of all cichlid species. A few other species of cichlids can live peacefully with their angelfish cousins. Many cichlids are aggressive because of their natural environment -- the waters these fish live in are teeming with predators and competitors. As such, in their natural environment they are supremely territorial; this behavior carries into their aquarium environment. Territoriality and protection of their young or their mates are prime reasons for aggression within a cichlid community. This being said, it's definitely possible for you to keep several different species of more docile cichlids with angelfish cichlids. South American cichlids, like the angelfish, tend to be much more docile than their African counterparts, although this is not always the case. Choosing South American cichlids from the same natural habitat as your angelfish can help create a harmonious, carefree environment for all of your tank mates. Because they are from the same region and waters as angelfish, they will prefer the same water temperature, pH and other factors of your tank. Species that would do well in a peaceful tank with your angelfish include Symphysodon and Heros species. Rainbow cichlids, dwarf cichlids and acaras are commonly available species at higher-end pet stores and aquarium stores. Because many of these peaceful cichlids tend to be shy and skittish, adding other species to the tank can often help "bring them out of their shells." Larger tetras and hatchet fish are two examples of schooling fish that will keep your tank moving and active. Smaller schooling fish, such as neons, will be seen as food by the others, so they aren't recommended. While there are certainly more types of cichlids you could keep with your beautiful, peaceful angelfish, it's important to remember that the species' tendency toward aggression isn't always the only consideration. Many cichlids prefer to have rather complex and large aquarium homes; you'll need to do some careful planning for these often skittish fish. Many cichlids enjoy caves and hiding behind or in various tank structures. This allows them all areas to make their own in the tank. Plants native to their habitat, caves and other structures are a must.